Calvero: I do. I also hate the sight of blood, but it's in my veins. Chaplin originally got his start in the music halls of England, doing baggy pants comedy and music until his trip to America and his epochal signing with Keystone. In this late film, his first straightforward drama, Chaplin pays tribute to his music hall days while also exploring the hopes and dreads of entertainers. Chaplin stars as faded music hall comedian Calvero, who not only can't get work but has an inordinate fondness for the bottle. When he rescues despondent young ballerina Terry Ambrose (Claire Bloom), a friendship is struck between the two. Terry suffers from a hysterical paralysis based on both fear and guilt, and as Calvero tries to get her to see the worth of life, he ends up convincing himself. But his attempts at a comeback don't go so well and soon Terry is the one consoling him. She has also caught the eye of Neville (Sydney Chaplin�the son, not the brother of Charles), a young composer whom she had aided earlier, setting up an intergenerational triangle. Limelight is an odd amalgam of autobiographical material, not all of which relates to the music hall. After the disaster of Monsieur Verdoux, Chaplin also feared he was losing touch with his audience, which finds expression in both the nightmares of Calvero and the spectacle of audiences walking out on him in disgust. He's trying a little too hard for pathos here, but there's a sincerity that makes it more acceptable than it might be otherwise. Chaplin's notorious interest in teenage girls generations younger than himself is also somewhat skewered by the fact that Terry is enamored of Calvero, while he doesn't exactly reciprocate, at least in a romantic manner. Or perhaps that's just the famous Chaplin ego bursting through. Claire Bloom, an otherwise fine thespian, overacts wildly at times, causing one to suspect Chaplin may have (intentionally or not) somewhat sabotaged her performance. Young Sydney does an admirable job as the third leg of the stool, while Nigel Bruce as a theatrical promoter is showing his age and seems to be sleepwalking through the part. Even silent comic Snub Pollard makes a brief appearance. But the most renowned supporting cast member is one of the other great silent comics, Buster Keaton. Even though they only do a short comical music sketch together, it's a memorable pairing and Keaton is in fine form, stealing the screen from Chaplin (not the easiest thing to do). But that's really the only funny bit in the film, so those expecting the usual Chaplin would again be sorely disappointed. Even though this film was the impetus for the American Legion to drive Chaplin out of the country through its bizarre campaign of hatred, there's really nothing leftist or even political in this picture. Rather, there's a sentimental nostalgia married to a fear of growing old. Though there's not much fancy going on with the camera, there are a few beautiful segments. Most notable is the reveal of Calvero sitting in the shadows after Terry's audition; as he smiles at her success, the lights go out around him, enshrouding all but his eyes in darkness. It's a fitting image for Chaplin to use to say farewell to his past life, a quiet and moving acknowledgement that his old style of comedy was no longer in vogue. Image Transfer Review: The original full-frame picture (the film was released just before the adoption of widescreen) is nicely restored, with hardly a flaw to be seen in any frame. This marks a huge improvement over the Image disc, which used a recycled laserdisc transfer that was full of scratches and speckling. The titles here are slightly windowboxed, and detail and texture are generally quite good. The picture is much sharper than on the Image version, especially on a larger screen. Unfortunately, this is a converted PAL transfer and thus runs over 5 minutes shorter than it should due to the 4% speedup. PAL/NTSC artifacting is present throughout, with substantial ghosting and occasional blur visible at times. On pans, edges have a very digital appearance with significant aliasing, and look fairly ugly; once the camera comes to a rest, everything looks very clean again. This variance struck me as somewhat irritating, but on the whole it is superior in appearance to the old version. Audio Transfer Review: French and English are represented in 2.0 mono, and there's also a slightly tricked-up 5.1 DD track that is at a much higher sound level. There's plenty of hiss and crackle on all versions, but the music sounds decent, if a bit lacking in depth and presence. Strings occasionally sound a shade shrill, but well within the standards for 1950s mono. The surrounds on the 5.1 track are mostly reserved for crowd and traffic noises, and thus are noticeable when they become engaged. Extras Review: A second disc is devoted to extras, most of which relate quite well to the feature. David Robinson provides a mostly dispensable introduction to the film. A 26m:35s "Chaplin Today" documentary contains footage of Chaplin's return to the UK in support of the release, as well as critical comments by Bernardo Bertolucci. The period footage points up how much Bloom was chosen for her resemblance to Chaplin's wife, Oona. Bloom is interviewed, as is Sydney Chaplin, making this a most valuable documentary. A four-minute deleted scene both introduces a new maid (who appears later in the film) and includes a touching sequence of Chaplin and Claudius, the armless wonder (who is both referenced elsewhere in dialogue, and whose name appears in posters that adorn Calvero's walls). This segment was snipped by Chaplin shortly after the premiere, apparently on grounds of pacing, but it does add some additional resonance to the story. An unused 6m:12s segment from 1919 entitled "The Professor" features Chaplin as a flea circus proprietor, much of whose schtick ends up in Calvero's act. 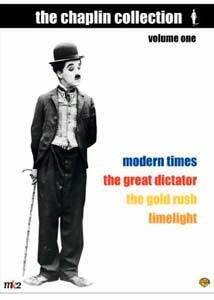 Chaplin wrote the story as a novel, Footlights, before writing the script; although the text isn't included here, there are two brief segments of Chaplin reading from it (2m:22s). Chaplin also composed the score for the film, and 36 cues are presented on this disc; it's not exactly a traditional isolated score, but it's very near the entire thing and thus serves an equivalent function here. Wrapping up the package are home movies from 1950 and 1959, a pair of trailers (in English and Italian), an enormous set of still galleries and a short poster gallery. Chaplin fans should be well pleased with this grouping of extras. The best of Chaplin's late films, a deeply personal picture, in a nice restoration despite PAL/NTSC artifacting. A substantial amount of extras make this an attractive purchase.